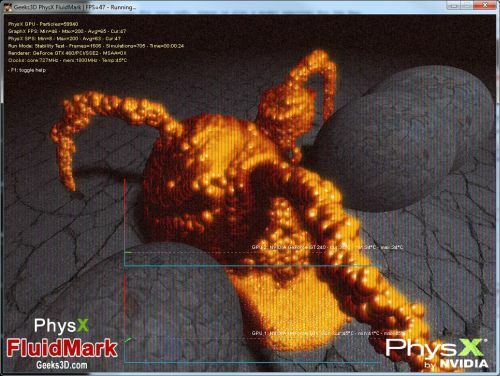 A new update of FluidMark, Geeks3D’s PhysX benchmark is ready for downloading. The main feature of FluidMark 1.2.2 is the compilation with the latest PhysX SDK 2.8.4.4. The direct consequence of the use of PhysX SDK 2.8.4.4 is the use of the new driverless model. No longer need to install the PhysX System software to enjoy PhysX. Now any PhysX app can embed all necessary PhysX files and that’s exactly what FluidMark does. And the cool thing is that when NVIDIA will release an update of its PhysX System Software, just install it and FluidMark will use the new PhysX runtimes thanks to the update system in the new PhysX SDK (see HERE for more details). See this post and this one for additional details about PhysX and FP87 / SSE2. PhysXInfo has done some performance tests. You can read PhysXInfo’s article HERE (english) or HERE (russian). I also restricted the online score submission. Now only scores in fullscreen mode, without AA and without PostFX can be submited. The same kind of restriction will be used in the upcoming FurMark. FluidMark is a fluid simulation benchmark based on NVIDIA PhysX engine. The fluid simulation uses the SPH or Smoothed Particle Hydrodynamics method where interparticle forces are considered (SPH requires more CPU or GPU horsepower!). FluidMark support both CPU and GPU PhysX and in CPU mode, multi-core CPUs are supported (see HERE). Change: new post processing (post-FX) effect. Update: compiled with PhysX SDK 2.8.4.4. Change: scores submissions are limited to fullscreen mode + No AA + No PostFX. Bugfix: the resolution 1920×1080 was not saved at the closing of FluidMark. Why is 31 emitters 2x the speed of 3 on my Phenom II X4? yeah im seeing some interesting results with more threads on CPU..all scores are physx only results..multi core on..
async on wont allow me to run more that 3 emitters on CPU..it runs really bad on 4 and 5, and 31 refuses to run, just shows a black screen..
i can also run 60K particles over 8 emitters on GPU (196 no async,175 async) ..add one more emitter and the particles disapear..previously i could only run a max of 3 on GPU..